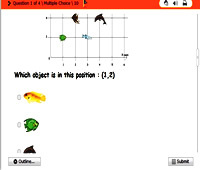 Math fun games suitable for children and arranged by grade / level. They include: crocodile & pirate waters board games, snakes and ladders games, math football games, math en garde duel games, fling the teacher math games, memory / concentration games, math game puzzles, basketball games, walk the plank math games and more. Percentages to decimals - math game.